Protein is critical for optimal health. No doubt about it and no getting around it. Hopefully, you are getting the proper amount of protein you need from your whole food diet, but a clean protein powder can help ensure you meet your protein needs and balance insulin levels in a very efficient and convenient way. I have known people who although they were meat eaters they were not getting the necessary protein they needed. So even if you are eating 50 to 60 grams of animal protein a day, it doesn’t do a body good if you have digestive issues that are not absorbing protein properly. The side effects can be mild to extreme lethargy, weak muscles and a foggy brain. I have been a personal fan of Sunwarrior Protein Powder for years now. It is the first Raw, non soy, all Vegan, high protein, whole grain sprouted plant protein powder available. I’ve tried many plant protein powders in the past but I never could get use to the grainy bad aftertaste of most of the Plant Proteins and I believe it is very important to stay away from the Soy Isolates. When I tried the Sunwarrior Protein Powder, to my surprise, I discovered that it actually tastes pretty good, blends easily and absorbs well. I never mix it with just water, I like to add it to my morning smoothies not only as a good source of clean protein but it is helpful in balancing out the whole fruit sugars keeping me fuller much longer. I also like to add a healthy fat such as flax oil or lemon flavored fish oil. Changing ones diet from un-whole processed foods to whole foods is critical to get the body healing at the source. Supplementing with a clean anti-inflammatory non-dairy protein powder can also be helpful to give your body the assimilable protein it desperately needs to be healthy. 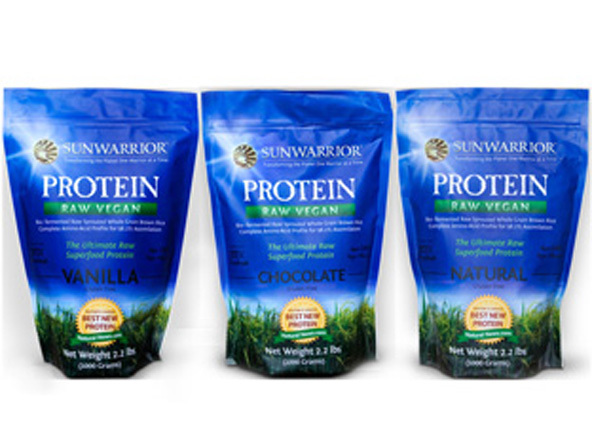 You may want to consider giving Sunwarrior protein powder a try as a supplement to your whole food eating plan. At 80% pure protein, Sunwarrior has created the highest and first raw complete vegan, hypo-allergenic superfood protein on the market. Not only does it taste superb but it blends exceptionally well and is easy to digest. In fact our protein is so easy to assimilate that it has 98% correlation rate to mother’s milk and a 98.2% digestion efficiency rating making it one of the highest digestibility and efficiency ratings of any other protein source. We use an old world process of combining the sprouted endosperm and the bran from Raw Sprouted Whole Grain Brown Rice. This unique process creates the first complete hypoallergenic Protein which is made up of all 9 essential amino acids and other non-essential amino acids in a perfectly balanced amino acid profile. Sunwarrior has a 98% Correlation rate to Mothers Milk and a 98.2% digestion efficiency making it one of the highest digestibility and efficiency ratings of any other protein sources (compared to whey and soy). Highest Net Protein Utilization score of any vegetable based protein and the highest ratio of amino acids converted to proteins. Sunwarrior is created with a Low Temperature natural Enzyme process that does not use any chemicals or acid hydrolysis (like most proteins do). Sunwarrior Protein is naturally rich in Vitamins and Minerals and contains high amounts of Antioxidants, Tocopherols, Tocotrienols and other essential nutrients – such as thiamin, riboflavin, niacin, phosphorous, iron and potassium. Using Sunwarrior Increases the efficacy and absorption of vitamins and minerals. There has been a direct correlation between the use of Sunwarrior Protein and the absorption of vitamins. Because Sunwarrior Protein is so digestible it can be easily assimilated by infants, the elderly and adults – The World Health Organization may be using Sunwarrior Protein in the future to feed malnourished individuals because of the hypoallergenic profile and superior absorption that Sunwarrior has been shown to have. There is currently a clinical trial which shows promise that Sunwarrior Protein aids in the absorption of vitamins in Aids patients. There has been a direct correlation between the use of Sunwarrior Protein and the absorption of vitamins in Aids patients where other proteins do not provide such synergistic affects during the intake. Weight Loss: Clinical studies in Japan have shown that by providing Rice Protein as a staple in a diet it can act as a weight control vehicle. This is especially because of superior absorption rates. Cholesterol: Clinical studies have shown promise that Sunwarrior has cholesterol lowering potential and the USDA is currently using Sunwarrior in trials to see if it may help control high blood pressure.